And we’re back, with looks at S.H.I.E.L.D., the new Power Man mini, and Thunderbolts. Plus: Brief Recommendations, Miscellany and Links of the Week! Spoilers abound! S.H.I.E.L.D. #3 – “The Theory of Eternal Life” (Jonathan Hickman, Dustin Weaver, with colors by Christina Strain and Justin Ponsor; Marvel Comics) I’m starting to feel like I can post the same review for this title once every two months. I love Hickman’s ambition and his eagerness to both embrace and subvert classic Marvel themes. Dustin Weaver’s art seems to improve with each issue, and despite some small problems in the first issue, Christina Strain has done a wonderful job. This issue introduces our villain, the man who has perverted the Brotherhood of the Shield: Sir Isaac Newton. Hickman fills in more of the gaps in early Marvel/S.H.I.E.L.D. history (complete with a battle between Galileo and Galactus(!)) while offering the reader a fun-house mirror reflection of a traditional Marvel villain origin story. Over the last two issues, I’ve been most interested in watching Hickman lay the groundwork for a secret history of the Marvel universe, but for the first time, I think I’m more interested in his efforts to effectively integrate historical figures into a superhero universe – how does one transform a person from a famous mathematician and physicist (described by some as the greatest genius that ever lived) into a Marvel supervillain? The secret history is still fascinating, as we get some hints about how S.H.I.E.L.D. was corrupted, why the Dark Ages happened in the MU, but the compelling part is watching Hickman “sprinkle [his] Jack Kirby/Stan Lee fairy dust” over these famous polymaths. Hickman fully embraces the weirdness… hell, the flat-out silliness that lies at the foundation of the Marvel Universe. This issue is an homage to the pulpy genre fiction that lies at the core of modern superhero comic, complete with a melodramatic (caped!) villain who explains his motivations in a lengthy didactic monologue to a restrained captive. 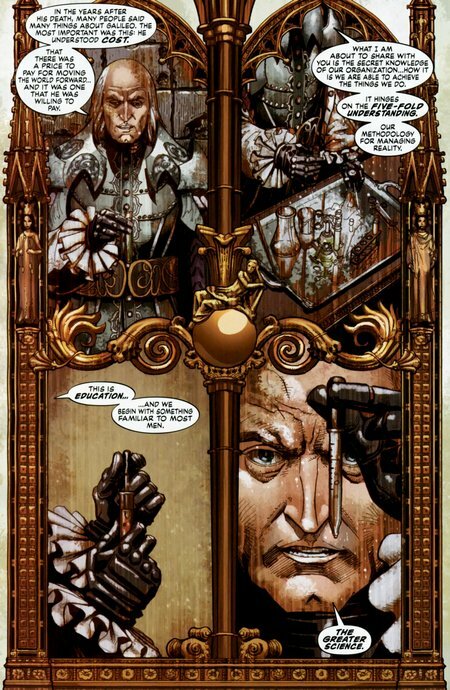 Read this comic and tell me that Hickman’s Newton isn’t an Enlightenment version of Dr. Doom. I was initially bothered by the historical inaccuracies — the fall of the Umayyad caliphate marked the beginning of the “Islamic Golden Age”, not the “darkest of ages”– but as I read the book a second time, those details became less important. After all, this is a story from the perspective of the villain, a character who embodies the best and worst of the Enlightenment that he inspired. Hickman casts Newton as a larger-than-life figure, both the brilliant polymath that we are familiar with and a brutal man who stands for the evils of colonialism and early imperialism (as Doom himself stands for post-WWII totalitarian states and the Red Skull stands for fascism). This is most evident in the one emotionally affecting scene of the book, where Newton beds Morda, the Deviant woman. This scene reflects a uniquely Marvel take on imperialism/colonialism, with the Deviants standing in for ancient/indigenous culture. Isaac Newton seduces the native woman under false pretenses to gain access to the secrets of her culture – evincing awe while harboring feelings of disgust and superiority to her people. Newton was a step away from giving the Deviants blankets infected with smallpox. Despite the beauty of these brief scenes, this book still leaves me a little cold. Weaver, Strain and Ponsor are still doing some breathtaking work – I particularly love the transition between the scenes in Italy and Iraq and the page below, which is eerily reminiscent of a static filled vintage instructional video. I can’t deny that this book is formally brilliant. I love Hickman’s commentary on the Marvel Universe and his love of embedded narratives, particularly in the Galileo scenes: Newton tells Nostradamus a story in 1953 about Galileo in which Galileo tells a story in 1582 about Al-Azdi in 750 completed by the contemporary Newton. 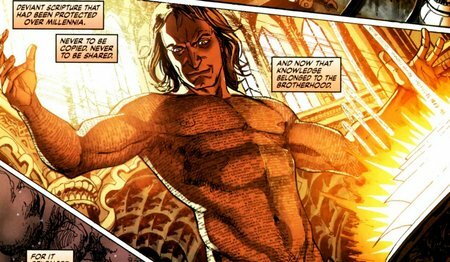 I can’t wait to find out whether my suspicion that Newton is Leonid’s father is proven correct (see Leonid’s vision in the last issue), and what the true meaning is of Nostradamus’ vision, and the link between S.H.I.E.L.D. and Hickman’s “Four Cities” arc in Fantastic Four. But the flaws are all still there. The dialogue is still stiff and overly portentous. The characters are flat archetypes, and I hope that Hickman plans to flesh them out a bit more in coming issues. I think it’s fine for a writer to use archetypal characters that speak in heightened language if s/he thinks the story demands it, but any character in a story, no matter how seemingly inconsequential, should be rich and fully realized. Every single character. Hickman has Newton say all the right things, but it all feels empty. What motivates Isaac Newton? What are the stakes of this coming conflict for him? What was it that he believed, that made him so different, so unique? I can only hold out hope that Hickman will explore that more in forthcoming issues. For now, I’d say wait for the trade if you’re not already buying this. Shadowland: Power Man #1 (Fred van Lente, Mahmud Asrar; Marvel Comics) In a perfect world, mainstream superhero titles would be published in a hefty trade paperback format on a quarterly or biannual basis. I’ve always maintained that the best way to read some of my favorite writers, from Grant Morrison and Ed Brubaker to Brian Michael Bendis and Paul Cornell is arc by arc. I find most single issues frustrating, and the experience is akin to having a prose book pulled out of my hands just as I complete a chapter. 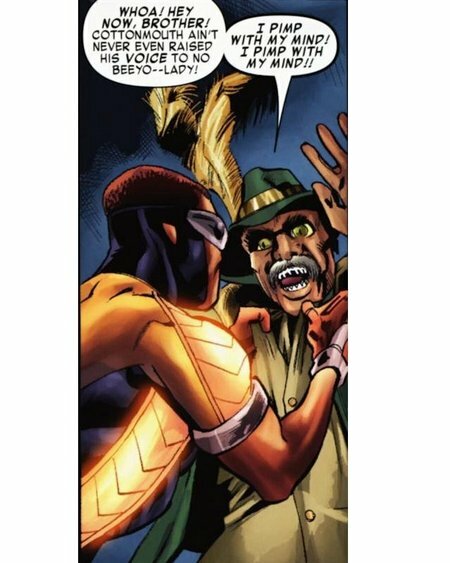 In this first issue of Power Man, Fred van Lente proves me wrong with a near-perfect 30 page comic. It’s an old-school first issue that introduces the protagonist and his supporting cast, sets the stage for some early challenges, and hints at an intriguing mystery. Van Lente’s sharp dialogue, keen wit and excellent sense of pace transform a book that could have been an obvious update of the “Hero for Hire” theme into something special. Don’t get me wrong, I’m still interested in seeing how Van Lente plays with the moral dilemma faced by Victor, but I was struck by how often I smiled while reading this book. I would like for this book to be more specific to the community and neighborhood that it depicts, but that’s a minor quibble. A clever wit goes a long way. Thunderbolts #147 (Jeff Parker, Kev Walker; Marvel Comics) – This is quickly becoming my favorite book at Marvel. David said all there is to say about Luke Cage, but let’s talk about John Walker. Walker was introduced by Mark Gruenwald in his classic Captain America run as a morally compromised wannabe patriot. This was a guy who paid a villain to give him powers and hired some buddies to stage superhero battles (who he later killed in a fit of psychotic rage). Gruenwald used the character to satirize the American Right during the Reagan era (particularly in the classic “Captain America No More” arc), and Walker’s been the token blowhard conservative ever since. As readers of the Avengers corner of Marvel know, he later joined Dan Slott’s version of the Mighty Avengers (don’t bother reading) and was crippled during Parkers’ contribution to the Siege crossover. Parker’s used Walker sparingly throughout the first few issues of his run, mostly to nod at his toughness or authoritarian streak. 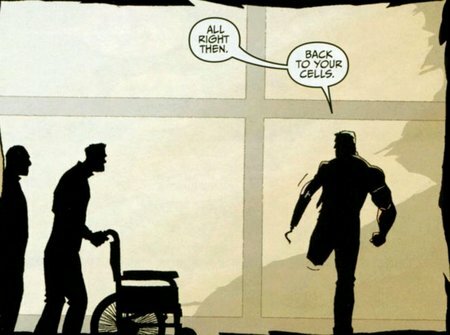 One thing that stuck with me in an earlier issue was when we saw Walker refuse prosthetics, a commonplace interaction in the real world that must be rare in a Marvel universe filled with advanced technology. The message – Walker had learned his lesson. No more shortcuts. Parker continues the theme this issue with the soon to be classic confrontation between Walker and escaping prisoners. Parker could have had Walker call for help, or have a weapon. Instead we see one man against many. No weapons. No magic. One leg. The best part of this scene? That third panel, where Walker wavers, just a little. In that moment, you’re reminded that this confrontation could have, should have gone the other way. Of how much will it took to stand straight on one leg. Oh, and I can’t forget Kev Walker. His linework is unique, dynamic and clear. 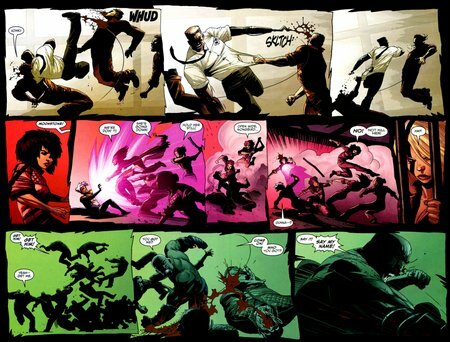 His action scenes improve with each issue. What I love most about Walker’s art is how he evokes a clear sense of specific place, particularly in the scenes on the Raft. He transforms the prison into a character in its own right, a source of sublimated tension for the heroes. We’re all familiar with the role of prisons in the superhero narrative. Within the story, they stand for the failure of civil authorities to effectively manage or contain threats. For the reader, prison reminds you of the endless nature of these comics. Watching Lex Luthor carted off to jail reminds you that the escape is inevitable. 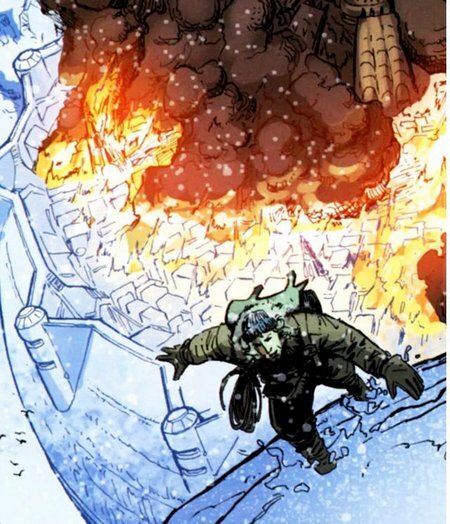 In Thunderbolts, the Raft, designed to hold the worst of Marvel’s villains, is intended to fly in the face of that age-old theme, and Walker seamlessly blends traditional and modern ideas about “supermax” prisons into its design. Walker’s Raft features the steep, craggy bluffs we associate with Alcatraz, classic holding pens from middle of the century prisons and ultramodern force fields and security cameras. This allows him to manipulate the tone and the atmosphere of the book without moving location, sometimes even on a single page. 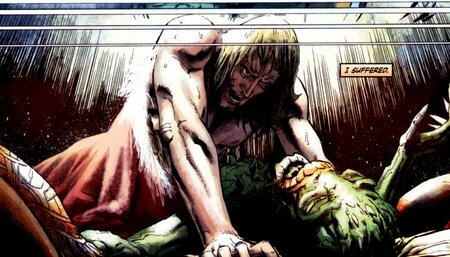 Incredible Hulk #611 (Greg Pak, Paul Pelletier; Marvel) Greg Pak’s writing on the Hulk is just breathtaking. I was a big fan of Peter David’s work on the character (he was the only one who really got the Hulk to work on a monthly basis), but Planet Hulk/World War Hulk followed by Pak’s work on this title surpasses it. Daytripper #9 (of 10) (Fabio Moon, Gabriel Ba; Vertigo/DC) Go buy this now. Power Girl v2 #15 (Judd Winick, Sami Basri; DC Comics) This is surprisingly good. 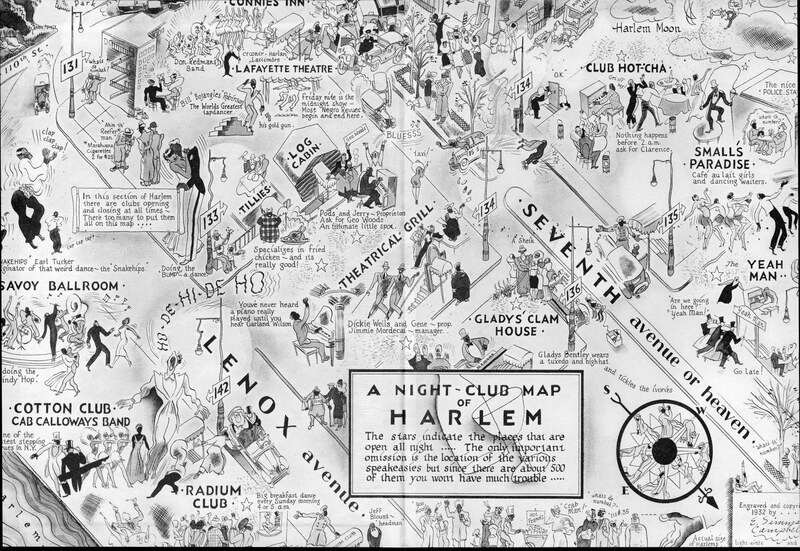 The Left Bank Gang (Jason, Fantagraphics Books) F. Scott Fitzgerald, Ernest Hemingway, James Joyce as cartoonists that pull a heist. Go read this now. 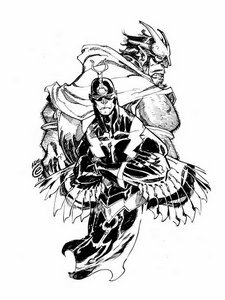 Black Bolt and Gorgon of the Inhumans by Eric Canete. Brightest Day is still terrible, but this is a great image by Ryan Sook. Click through for the larger image. h/t DC Universe: The Source. Tucker Stone and David Brothers collaborated for a four part series of articles on 4th Letter! and The Factual Opinion analyzing Don McGregor, Billy Graham and Klaus Janson’s Panther’s Rage story in Jungle Action. 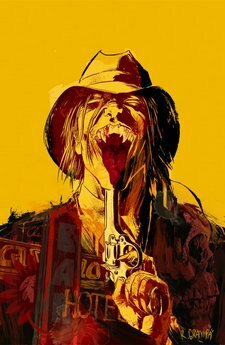 The variant cover to Vertigo’s American Vampire #6. This is an absolutely gorgeous image. Rafael Grampa’s work never disappoints. 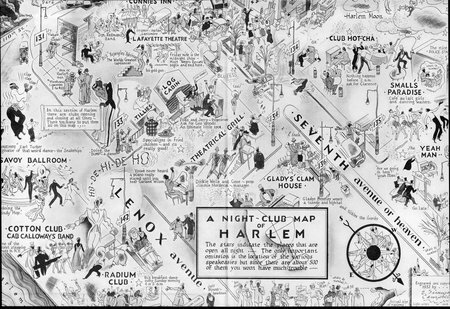 Via Mike Lynch and Mike Thibault, a 1932 era nightclub map of Harlem by E. Simms Campbell, an African American cartoonist known for his work with Ebony Magazine. Click through for a more detailed view. Frank Miller’s wack Gucci ad, featuring Chris Evans and Evan Rachel Wood has surfaced. h/t The Beat. Mike Dorf of Dorf on Law explores legal positivism and the “right answers” thesis in a column providing advice to 1st year law students. James Kwak on management consulting myths. Variety has a great piece on how Netflix is changing the American film industry. Sometimes internet memes are good. Here’s F*ck You, the new track by Cee-Lo Green. Angela at Post Bourgie explains how the Boondocks fell off. via Gawker, a trailer for AMC’s adaptation of Robert Kirkman’s The Walking Dead. Looks pretty good. Ta-Nehisi Coates of the Atlantic Monthly entered the “phantom zone” to complete a book, and has mostly handed his blog over to a dream team of creative people and public intellectuals. Here are some highlights: Cynic on the popularity of fraternal groups in the black community; Hua Hsu on Inception and memory palaces; the art of the leak, Brendan Koerner on supply-side solutions to the suicide rate, the impact of an artists’ personal behavior on ones’ admiration for their work; Ricardo Gutierrez with amazing mixes (1, 2) and comments on audio engineering; Sara Mayeux on white privilege, stop and frisk, what we talk about when we talk about immigration (and part 2),and how laypersons can learn more about the criminal justice system; G.D. of Post Bourgie on Donovan McNabb; Alyssa Rosenberg on music; Ayelet Waldman on incarceration; Mark Kleiman on drug policy, criminal justice, early gangbanger fiction , incentive management and classified information; Andy Hall on the Civil War; and Mr. Len on being a fan. Read them all, they’re brilliant. Next week (or soon): Fantastic Four, Batman, Black Widow, Superman/Batman and Bulletproof Coffin!